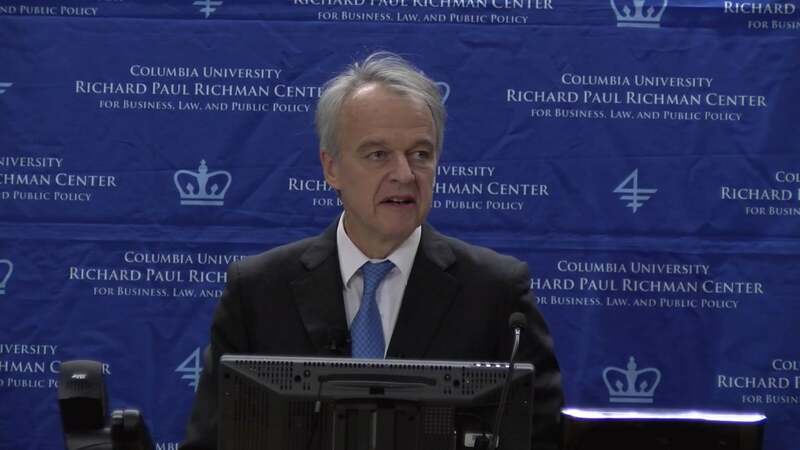 On February 25, 2019, the Richman Center hosted John Mahoney (Co-Chair of Global FIG, Goldman Sachs) for a discussion on the rise of Chinese fintech and the lessons it holds for the United States. In this video, part 1 of 2, Mahoney presents about China’s fintech landscape, the factors driving growth, and future outlooks. It's really a pleasure to be here tonight and to to speak about a topic that I'm very interested in spent a lot of time in and I'm passionate about which is fintech as Todd said. I was in Hong Kong for five years. I spent most of that time on the mainland in China and I suppose a lot of that time particularly the latter half of it dealing with FinTech in Asia. Both the startups and the big and the bigger fintech giants tonight I want to spend time on talking about what I think the drivers are of FinTech in China who the players are look at their models and then maybe offer a few words of where we go where I think things will go from here and I'll try to contrast that with theU.S. as I go through it. The presentations that I think been handed out and I'm not going to go through them page by page I think about Atrous try to anchor my comments to five or six pages. But when we get into Q and A we be happy to talk about some of the other. Anything you see in there that we haven't otherwise covered. And I'm going to go actually I'm not going to go anywhere yet. Just as a preface and I apologize for this being Elementary for most of us but you know fintech is a big deal in China and it's growing very rapidly. Three of the top six fintech companies by market cap are implied market cap are in China and I'll spend a second just to find these are lays out because when I come back to them over and over again one is anti Financial which is Ali Baba affiliates which just raise money this past summer at 150 billion dollar U.S. valuation. The second is 10 percent. And unlike Ali Baba which is spun off its fintech business into at ten cents fintech business is embedded inside of it and it mostly in two places one is we chat pay its payments business and the second is its ownership stake in a bank called the bank. And those are the two primary fintech businesses inside of Tencent but still very much part of 10 cent and those have probably have a market value of over 100 billion dollars. And then the third in the top six globally number six is a business called Blue fax which has a wealth management and lending business. Internet online lending business mobile lending business started by paying on which is an insurance company and very very forward leaning generally in FinTech and it started a number of successful fintech businesses. So these are these are these three that I named are our sirrah. They have serious global ambitions. They've achieved rapid Shreeve large scale quite rapidly. They are large enough to undertake basic technology R and D and then apply that to their business so they're very active in a block chain. Big Data, IoT, cloud and as I said they're big enough to do their own research and then and then make it an important part of their business. And they've all developed sophisticated use cases and tight integration with a whole variety of of commerce and social media partners in China. And it just should note this. This is in the end. All this is in the context of a very active China. Sec. China tech sector overall where there's been a ton of startups private placement activity and Fin and IPO activity. There are more unicorns in China than there are in the United States. And they they form about twice as quickly as they have in the U.S. And and so so so this is in that context I'm also going to talk about startups of which there have been many in the FinTech sector and I think it will be an important part of the FinTech sector going forward as well as is what the incumbents are doing. The traditional financial institutions are doing in this area so now I'm going to go to Slide 3 and just go and so and I want to talk a bit about how I see the drivers. One is first demographics as we all know China is very large one point four billion people about four times the size of the U.S. GDP is about 60 percent of the U.S. but growing at two to three times the rate is expected to pass the U.S. in the next decade and about a decade per capita income in China is about a fifth of the U.S. But that gap is closing and it's going to narrow appreciably over time is projected. But underneath all this and importantly.